I’ve now had the chance to see at least 9 different shark species, ranging from 1 kg to over 250 kg and I’ve placed tags on 4 of the larger sharks that we have caught. 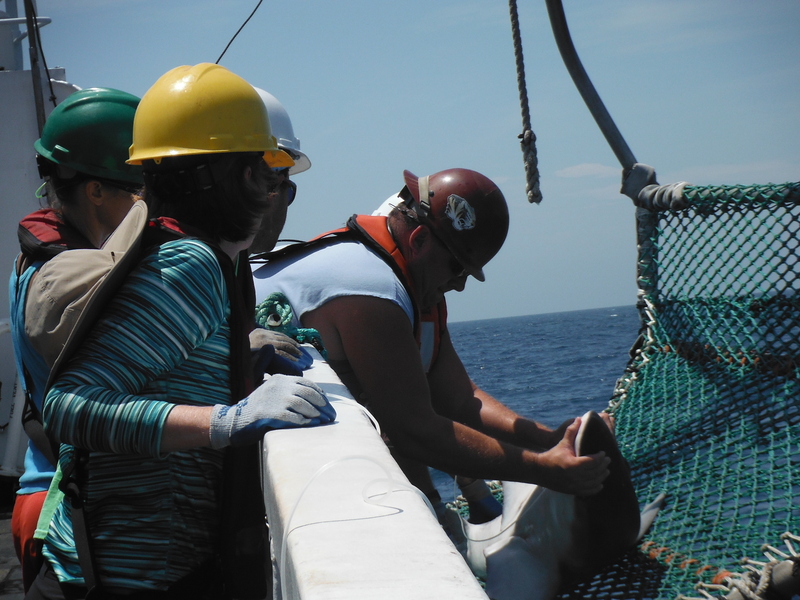 These numbered tags are inserted below the shark’s skin, in the region of the dorsal fin. A small piece from one of the smaller fins is also clipped off for DNA studies and we make sure to record the tag number. 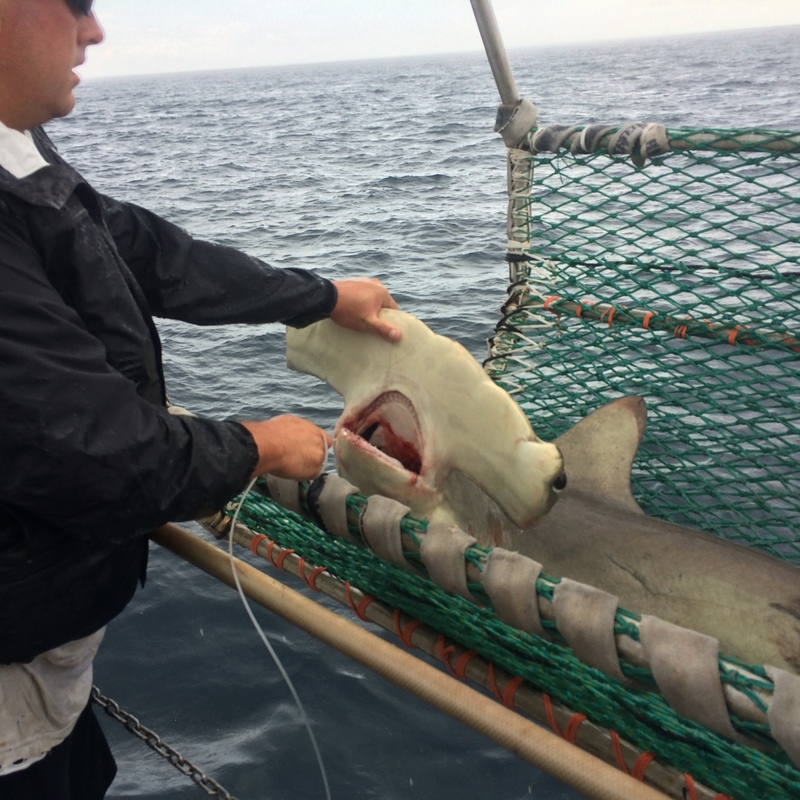 If a shark happens to be recaptured in the future, the information gathered will be valuable for population and migration studies. The video below shows the process. After checking that the tag is secure, I gave the shark a pat. I agree with Tim Martin’s description that it’s skin feels like a roughed-up basketball. We’ve had a busy couple of days. 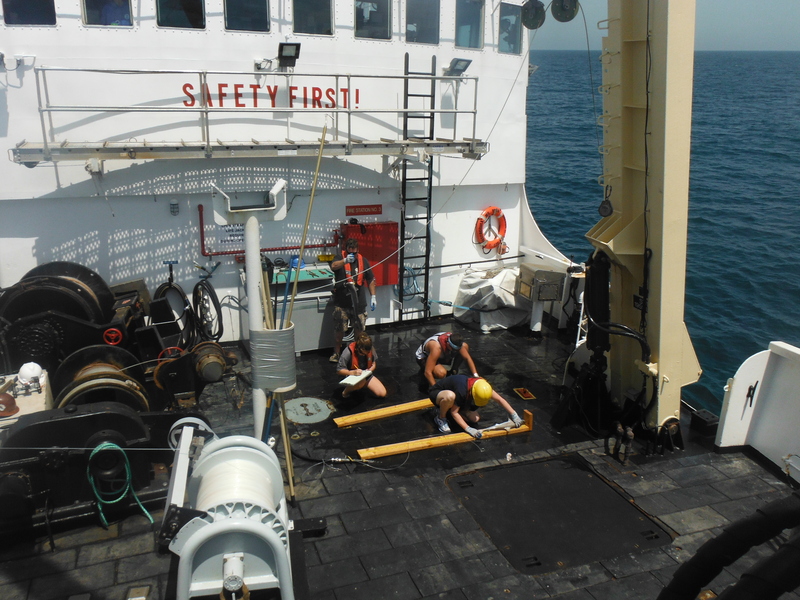 The ship is further south now, just off the coast of Florida, and today we worked three stations. 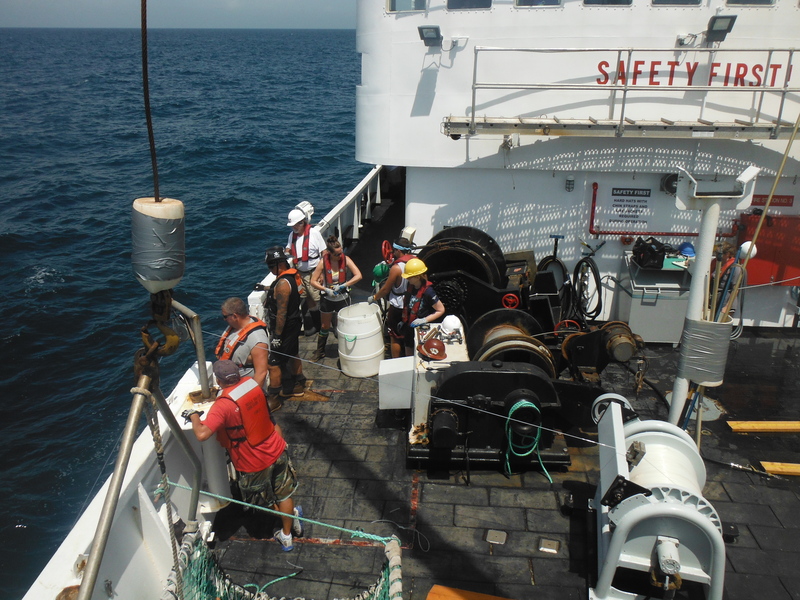 The high daytime temperatures and humidity make it pretty sticky on deck but there are others on board working in tougher conditions. 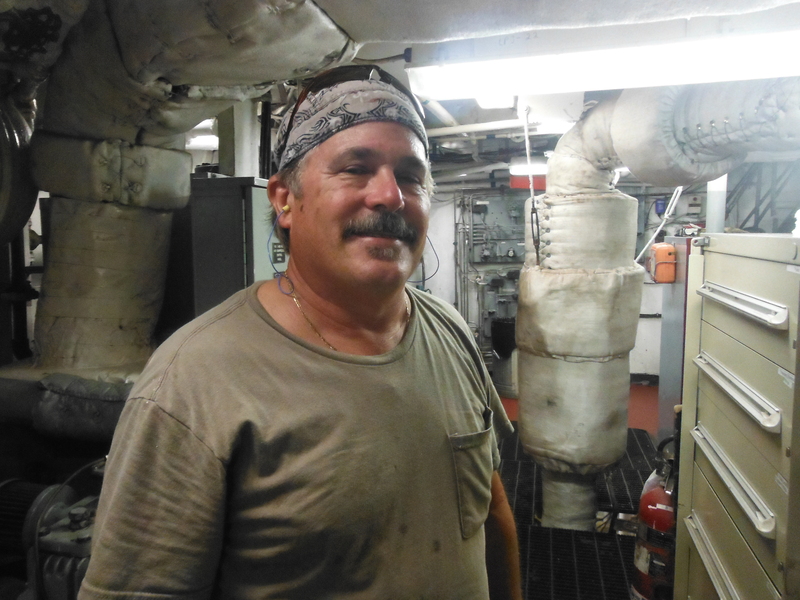 Many thanks to Jack Standfast for the engine room tour. Here it is… The RO unit! 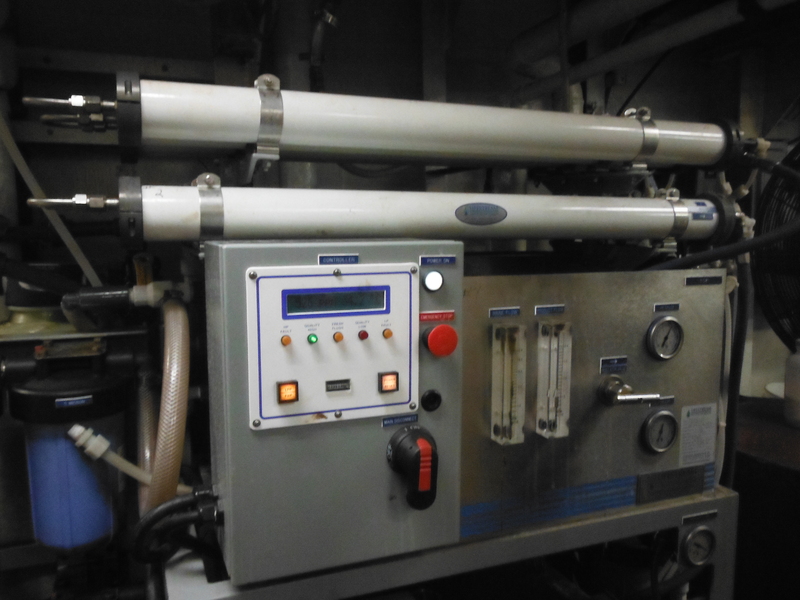 about the desalination unit (reverse osmosis) for fresh water generation and energy conversions propelling the vessel. I know, I know… but it was really interesting. Sustainability, no matter what your discipline is, refers to the wise use of resources with an eye toward the future. In environmental science we specifically talk about actively protecting the natural world through conservation of both species and habitat. Each year when I prepare my syllabus for my AP Environmental Science course, I include the secondary title “Working Toward Sustainability”. I see this as a positive phrase that establishes the potential for renewal while noting the effort required to effect change. Sustainability is the major focus of NOAA Fisheries (National Marine Fisheries Service) as it is “responsible for the stewardship of the nation’s ocean resources and their habitat.” I’m sure that most readers have some familiarity with the term endangered species or even the Endangered Species Act, but the idea that protection extends to habitats and essential resources may be new. Getting the hook out of the big ones is equally challenging. Two spinner sharks on the line. Under this fisheries act, Regional Fishery Management Councils develop Fishery Management Plans (FMP) for most species (those found in nearby regional waters) which outline sustainable and responsible practices such as harvest limits, seasonal parameters, size, and maturity parameters for different species. 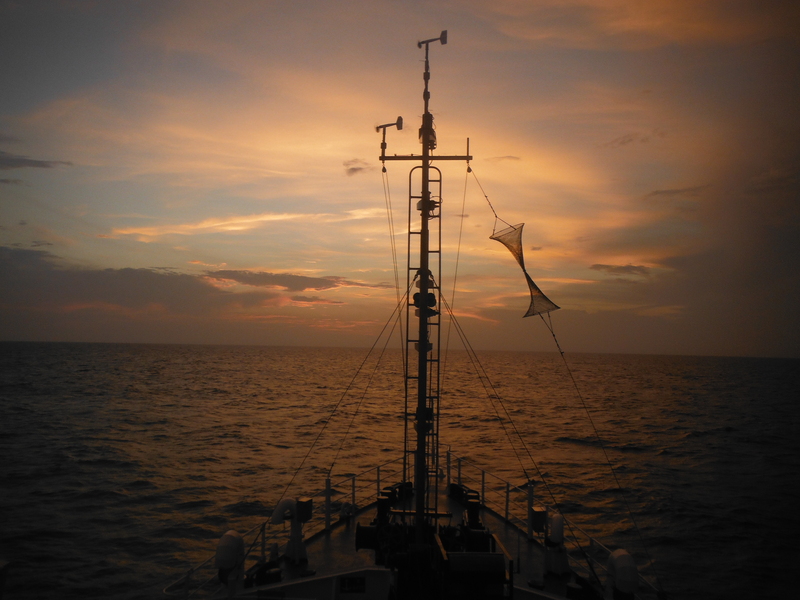 Regional councils rely heavily on research when drafting the FMP, so the work done by NOAA Fisheries scientists and other researchers around the country is critical to the process. Drafting a Fishery Management Plan for highly migratory fish that do not remain in U.S. waters is challenging and enforcement even more so. Recall from a previous blog that great hammerheads are an example of a highly migratory shark. Shark populations around the globe suffered significantly between 1975 and 2000, and for many species (not all sharks and less in the USA) the decline continues. This decline is linked to a number of factors. Improved technology and the development of factory fishing allows for increased harvest of target species and a subsequent increase in by-catch (capture of non-target fish). Efficient vessels and refined fishing techniques reduced fish stocks at all levels of the food web, predator and prey alike. 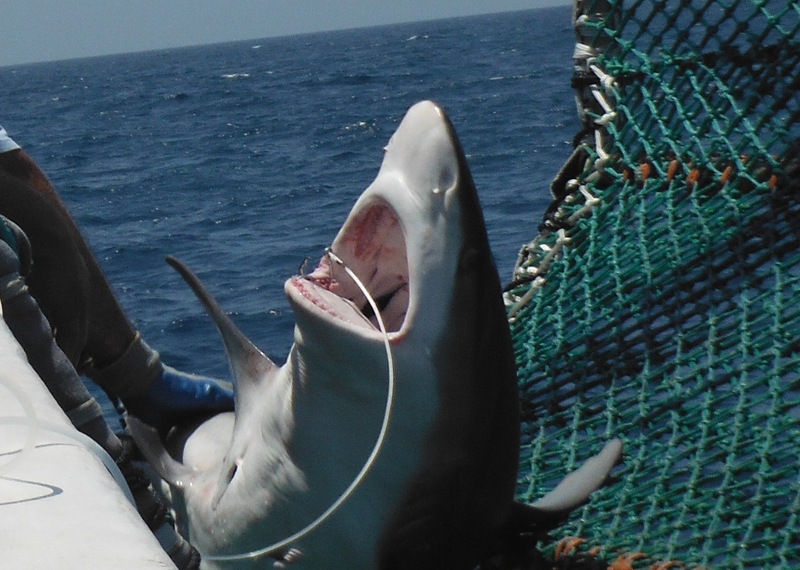 More significantly, the fin fishing industry specifically targets sharks and typical finning operations remove shark fins and throw the rest of the shark overboard. These sharks are often still living and death results from predation or suffocation as they sink. Shark fins are a desirable food product in Asian dishes such as shark fin soup, and are an ingredient in traditional medicines. They bring a high price on the international market and sharks with big fins are particularly valuable. 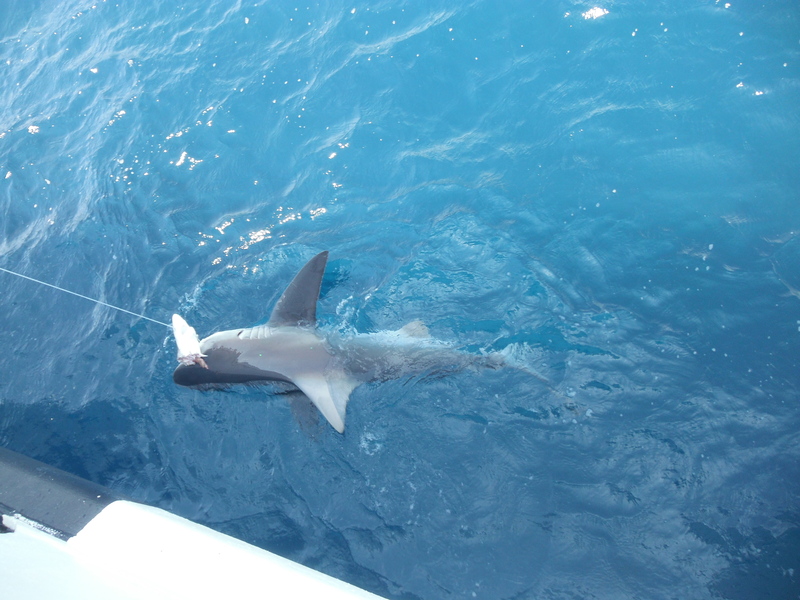 A scalloped hammerhead in the cradle. 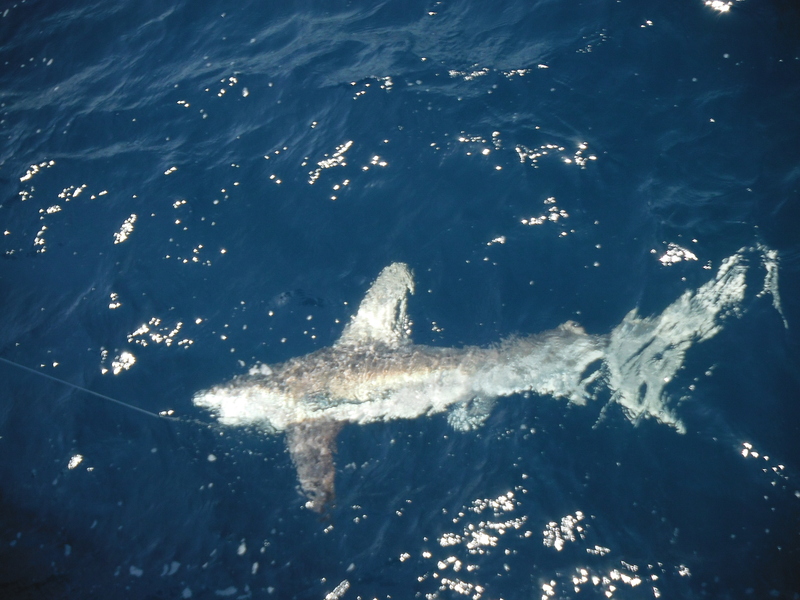 This was the fist shark I tagged. The video below featuring the Northwest Atlantic Shark cooperative summarizes these threats to shark populations. It must also be mentioned that in the 25 years after the release of the book and film “Jaws”, fear and misunderstanding fueled an increase in shark hunting for sport. The idea that sharks were focused human predators with vendettas led many to fear the ocean and ALL sharks. In his essay “Misunderstood Monsters,” author Peter Benchley laments the limited research available about sharks 40 years ago, even stating that he would not have been able to write the same book with what we now know. He spoke publicly about the need for additional research and educational initiatives to spread knowledge about ocean ecology. 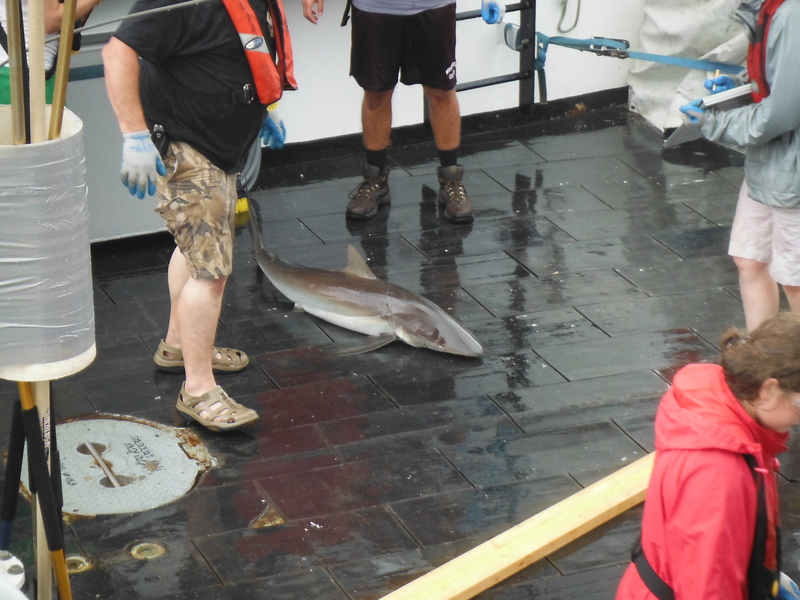 Close up of our first cradled sandbar shark. This is one of my favorite pictures. This one is pretty big for an Atlantic sharpnose. species including great white and tiger sharks, but it doesn’t represent all species. In truth, many shark species are actually mesopredators (mid level), and are a food source for larger organisms. Therefore conservation efforts need to extend through all levels of the food web. The Atlantic sharpnose (Rhizoprionodon terraenovae) and Silky Shark (Carcharhinus falciformis) are examples of mesopredators. 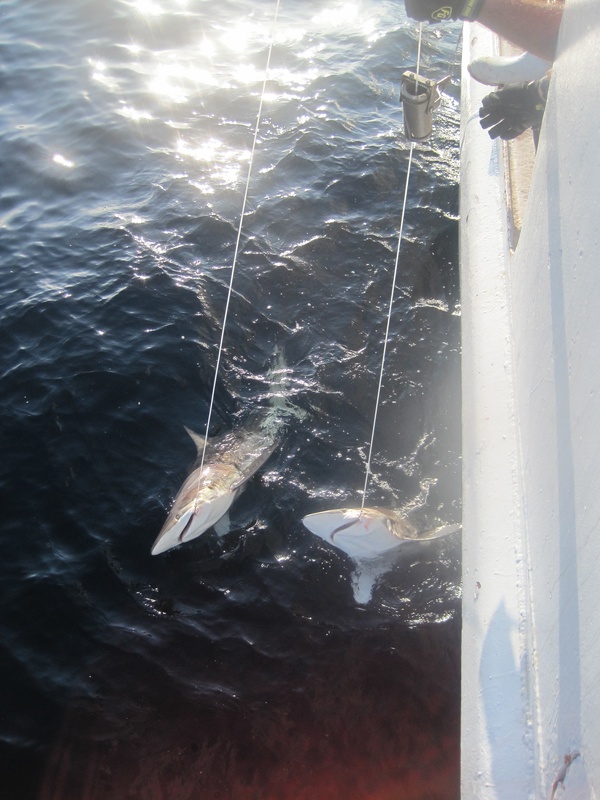 It was not uncommon for us to find the remains of and small Atlantic sharpnose on the hook with a large shark that it had attracted. Sandbar shark with Atlantic sharpnose also on the line. Its a beautiful day on the aft deck. William” Trey” Driggers is the Lead Scientist of the Shark Unit. Trey is a graduate of Clemson University and earned his Ph.D at the University of South Carolina. 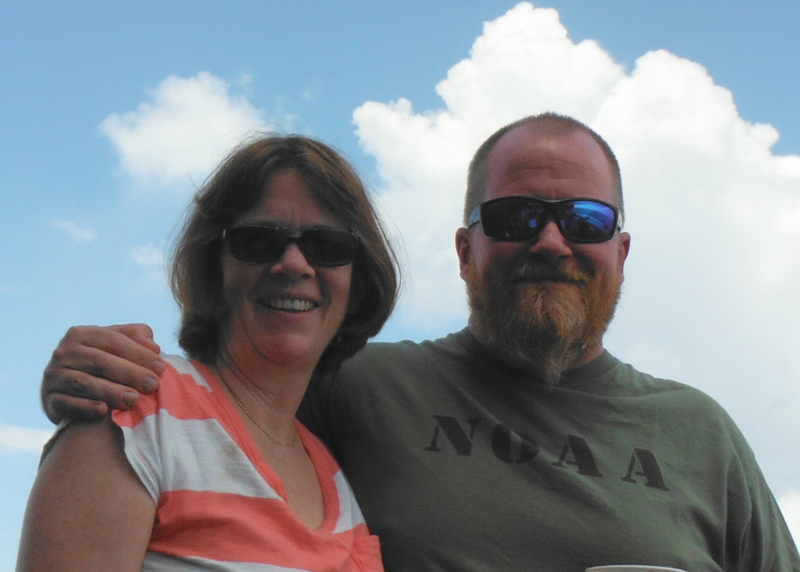 He’s been with NOAA for over 10 years and is the Lead Scientist of the Shark Unit, headquartered in Pascagoula, MS. His responsibilities include establishing and modifying experimental protocols and general oversight of the annual Shark/Red Snapper Longline Survey. 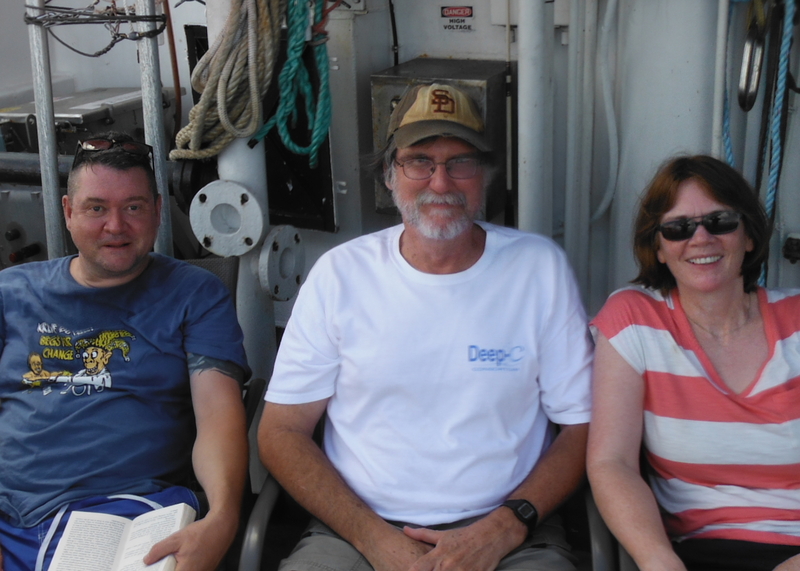 Trey has authored numerous scientific articles related to his work with sharks and is considered an expert in his field. He is a field biologist by training and makes it a point to participate in at least one leg of the this survey each year. I asked Trey if analysis of the data from the annual surveys has revealed any significant trends among individual shark populations. He immediately cited the increased number of sandbar sharks and tied that to the closure of the fin fisheries. Approximately 20 years ago, the Sandbar shark population off of the Carolina and Florida coasts was declining. Trey spoke with an experienced fisherman who recalled times past when Sandbar sharks were abundant. At the time Trey was somewhat skeptical of the accuracy of the recollection — there was no data to support the claim. Today the population of Sandbar sharks is robust by comparison to 1995 levels, and the fin removal legislation is likely a major factor. Having the numbers to support this statement illustrates the value of a longitudinal study. Trey notes that it’s important for the public to know of the positive trends like increases in Sandbar shark populations and to acknowledge that this increase has come at a cost. The reduction and/or closure of fisheries have had radiating effects on individuals, families and communities. Fishing is often a family legacy, passed down through the generations, and in most fishing communities there is not an easy replacement. In reporting rebounding populations we acknowledge the sacrifices made by these individuals and communities. 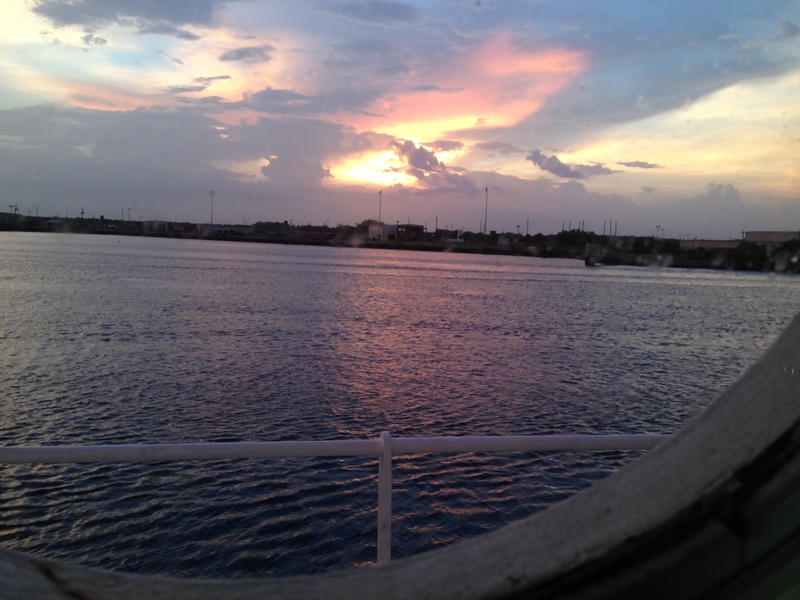 Personal Log- Last posting from sea. 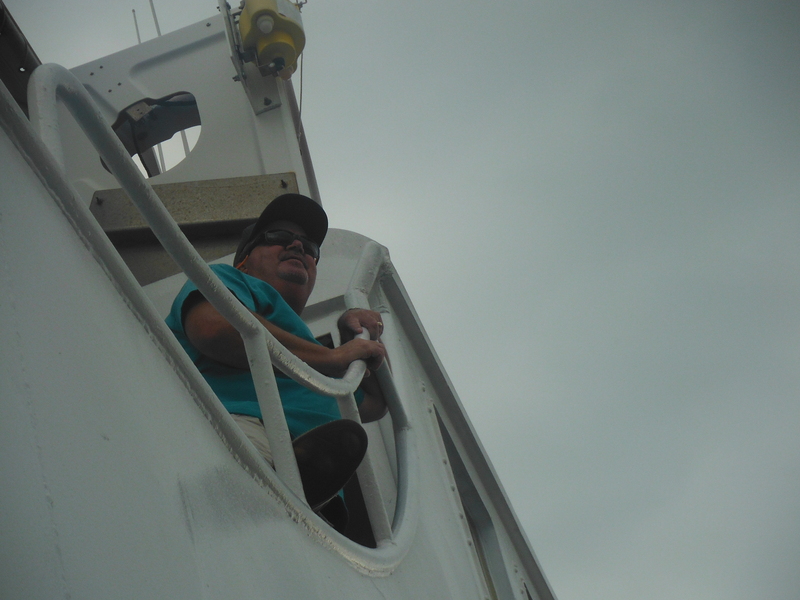 Thirty minutes before leaving Pascagoula we were informed that the V-Sat was not working and that we would likely have no internet for the duration of the cruise. We had a few minutes to send word to our families and in my case, TAS followers. I think most of us were confident a fix would happen at some point, but we’re still here in the cone of silence. It’s been challenging for all on board and makes us all aware of how dependent we are on technology for communication and support. I’ve gotten a few texts, which has been a pleasant surprise. One tantalizing text on the first day said “off to the hospital (to give birth)”, and then no follow-up text for weeks. That was quite a wait! I can imagine how it was aboard ship in times past when such news was delayed by months—or longer. I was looking forward to sharing photos along the way, so be prepared for lot of images all at once when we get to shore! As for my students, while it would have been nice to share with you in real time, there is plenty to learn and plenty of time when we finally meet. I’d like to thank Dave Nelson, the Captain of the Oregon II, who greeted me each day saying “How’s it going Teach?” and for always making me feel welcome. Thank you also to all of those working in the Teacher at Sea Program office for making this experience possible. 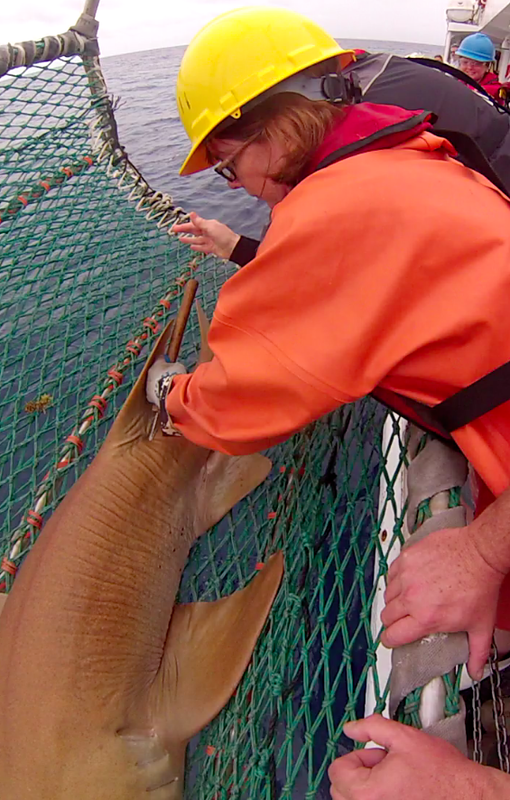 Being a part of the Shark Longline Survey makes me feel like I won the TAS lottery. I’m sure every TAS feels the same way about their experience. Special thanks to Kristin Hannan, Field Party Chief Extraordinaire, for answering my endless questions (I really am a lifelong learner…), encouraging me to take on new challenges, and for her boundless energy which was infectious. Sharks are SOOO cool. Here’s a final shout out to the day shift–12 pm-12 am–including the scientists, the Corps, deck crew and engineers for making a great experience for me. Ian and Jim – It was great sitting out back talking. I learned so much from the two of you and I admire your work. And, to all on board the Oregon II, I admire your commitment to this important work and am humbled by the personal sacrifices you make to get it done. Day shift operating like clockwork. Awesome day shift ops. Getting it done! This has been one of the hardest and most worthwhile experiences I’ve ever had. It was exhilarating and exhausting, usually at the same time. I often encourage my students to take on challenges and to look for unique opportunities, especially as they prepare for college. In applying to the TAS program I took my own advice and, with the support of my family and friends, took a risk. I couldn’t have done it without you all. This experience has given me a heightened respect for the leaps my students have made over the years and a renewed commitment to encouraging them to do so. Who knows, they may end up tagging sharks someday. Safe Sailing Everyone. 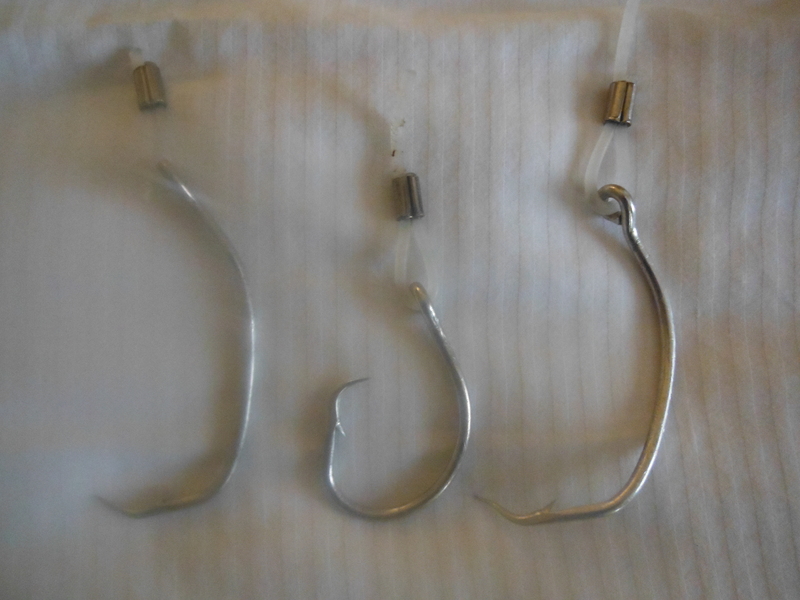 The ones that got away… It took something mighty big to bend the outer hooks. It took teamwork to get a hold of this silky shark (Carcharhinus falciformis). 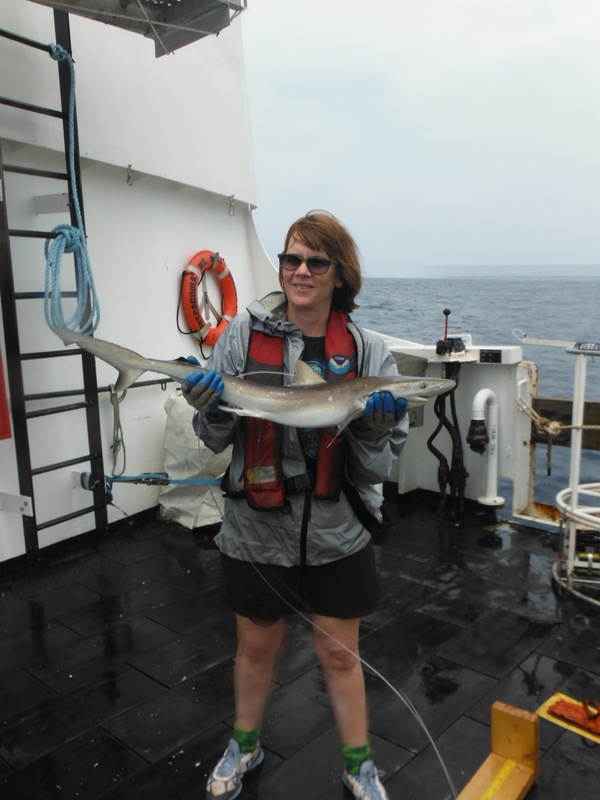 This entry was posted in 2015, Kathleen Gibson, NOAA Fisheries Service, NOAA Teacher at Sea and tagged Atlantic sharpnose shark, conservation, fin clip, finning, Fisheries Biologist, fisheries management, Fisheries Surveys, Great Hammerhead, Longline Shark Survey, magnusen-Stevens Fisheries Act, NOAA Ship Oregon II, nurse shark, sandbar sharks, scalloped, shark fins. Bookmark the permalink.